See the Doc? 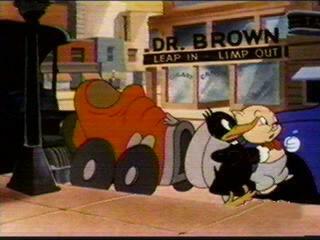 Behind Porky and Daffy is a building advertising a doctor's office. It proclaims "Dr. Brown - Leap in, limp out". Note: There were several staff members at Termite Terrace who were caricatured as gremlins in this picture. I've included a series of screenshots below and have identified several of the gremlins. If you know the identity of any others, or think I have one of them wrong, let me know so I can revise this! Thanks! 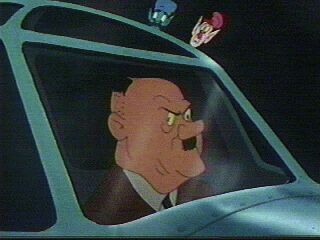 First there is a little speech by a Hitler caricature which mentions some interesting names and phrases. 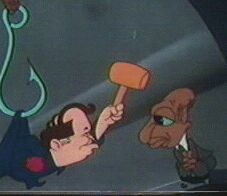 At one point he rants "Stop Fritz Frelink mit der Heimlich Binder und der What's Cookin' Doc!". You can listen to it here. Of course this is Friz Freleng and Henry Binder being mentioned.